Array is a specific variable and it can hold more than one value in a single variable. 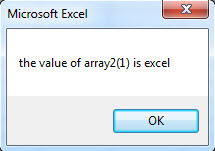 This section will describe that how to assign value to VBA array. This Array declaration will declare with 2 rows and 2 columns. This section will describe that how to assign value to VBA two-dimensional array.